We’re in the double digits now–Day 10. Sadly, today is the worst pain I’ve had thus far. My jaw has spent a good portion of the past 24 hours spasming. I’ll barely get it back into a comfortable position and it decides to jump out again. My elastics are, of course, extremely tight, so it’s difficult to move anything around. I’m still not entirely sure what purpose they serve. I can open and close my mouth quite alright when they’re off, so I’m failing to understand why, exactly, I need them. I learn to remove them myself this coming Tuesday though, so I suppose 1 more long weekend isn’t going to kill me. I was actually able to get some sleep last night! With the right amount of hotpacks, anything is possible. My swelling is nearly gone, but eating remains a difficult task because my feeling has not yet returned. I look forward to being able to locate my lips and nose again without the aid of a mirror. My mother, bless her heart, started adding peanut butter to my smoothies this morning, and I assure you, they are now the greatest thing since sliced bread. Here’s the recipe–delicious! If you mix that all up and blend it in that fancy Magic Bullet I know everyone and their dog owns these days, I guarantee you it’ll be a breakfast you’ll quickly become addicted to. Unless, of course, you’re lactose intolerant (or have the luxury of eating solid foods, like toast, for breakfast already). I can drink water from a cup now, but it can still become a quick mess if I try to drink too quickly. My lips are also returning to a size more resemblant of a white male than, say, an ogre. For those of you out there who are on the path to having this surgery carried out (a.k.a. getting the **** kicked out of your face), I assure you that the first 10 days are the worst. Once you become used to using heatpacks, eating soup and allotting an extra 45 minutes to brush, rinse, shower and eat in the mornings, your life will return to a more normal state. Hey Graham! Currently living day 10 of the splint life and it’s about as fun as I thought it would be . Actually I mostly forget it’s there until I have to eat or have to answer a question that requires more than a head nod. “Speaking” with it is a joke that everyone finds hilarious, except me (ok fine it’s pretty funny). I read this blog about two years ago and it felt like I would never be experiencing the post-op life, yet here I am! Thank you so much for sharing your journey and for keeping up with your readers. 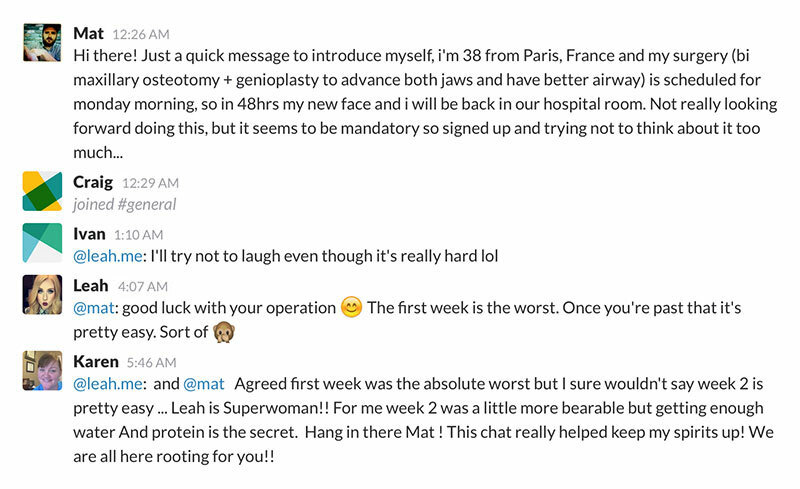 And thank you for creating the chatroom for fellow jaw surgery patients! You’ve helped so many people by creating this blog; I know it surely has comforted me. I love this blog so much because I find it so relatable. It’s 5 degrees here in Edmonton, Easter is right around the corner (and I have to miss it), and I’ve been seeing Dr. Lalh and Dr. Burke (who btw is retiring soon)…I feel like I’m you, just 6 years later! During my surgery, there was a complication where my mandible didn’t break the way it was supposed to. As a result, my surgeon wants to keep my elastics tight for an extra two weeks. Rather than loosening them at 2 weeks, he’ll loosen them at 4 weeks. This is fine, but I’ve only arranged to get 4 weeks off work, and I have a job where I talk to people all day. It looks like your speech became understandable pretty quickly after your elastics were loosened, but I was wondering at what point you were able to speak conversationally again? Hi Christina, it’s so cool that you are visiting the same orthodontist and surgeon as I did! I hope it’s a good experience for you. I had both jaws operated on and was able to speak somewhat conversationally again around the 4-week mark. That being said, speaking was uncomfortable and would lead to pretty high swelling on the days where I had to talk a lot, but it also works your muscles, so there are pros and cons. I recall speaking without much issue by the 6-week mark. Hey, you mentioned about expanding your upper jaw. Did the surgeon cut through the middle of your upper jaw? I mean like cut between the Rabbit teeth. Hey I’m 8 day post op double jaw surgery. I feel so lucky after reading all the comments. I don’t have any splints or elastics. The surgery was really happy with my bite sId I didn’t need them. I’m able eat mash potatoes blended veg, mince meat, scrabble eggs wheatabix etc. I’m on Day 10 and I’m so jealous of you. Imagine having done all of this except with a four month old baby. Yup. Double jaw surgery recovery with a baby = not fun at all. I’d kill for 45 minutes of peace to shower and eat and rinse. That’s impressive, Rhianna! I can’t even imagine having to take care of a baby while being so exhausted and immobile. Do you have any friends or family who can come over and help you out for the next couple weeks? My mother is staying over for a couple weeks and helping with my son and with various smoothies, but even so, double jaw surgery is a very different experience with a baby! I still play with him and wake up at night to change diapers and feed him and my pain is much worse – I can’t take any medication because I’m breastfeeding. The best thing I’ve got for pain is infant Tylenol which is doing nothing for me. I’m not sure if you’re even going to get this comment, but I’m on day 11 post op! I had lower jaw surgery, the surgeon took off my elastics the other day, but unfortunately I still have to wear them all the time, and only take them off to eat and brush my teeth. Although it’s only day 11, I’m eating food like chicken and pasta, I’m not sure if it’s good for my jaw but so far I’m loving it, got so sick of drinking my dinner. 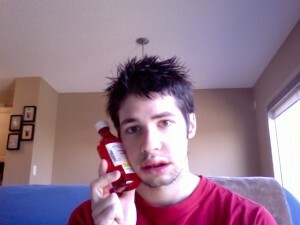 Also had top wisdom teeth removed. I’m 17 and weighed at 110lbs before surgery and went as low as 100.lb post op, that was scary! I’ve been reading your blog for 2 weeks now, and it has really helped me, so thank you. I hope you look at the comments sometime soon, thanks for being awesome! Hey 10 days post op double jaw surgery. I made it!! aha is it normal to feel tingling sensations and like itchy all over? And my palate is kind of swollen but no pain whatsoever. Hey 🙂 my name is Daniel and I am on day 8 post op, I had double jaw surgery. I have been reading this blog and it has definitely done it’s job, helping me understand my pain and know what’s coming. However I do have a question, how did you add strawberries and bananas to a smoothie? I haven’t been able to eat anything but ensure! The little seeds get caught in my small whole they left for liquids and air to pass through.. please help!? Hey Graham! I had my double jaw surgery 10 days ago with slight complications (a torn nerve in the left side of my jaw). Those first few days were definitely the worse! I’ve got most of the feeling back in my face except the left half of my chin and lower lip (from the torn nerve) and my nose. My surgeon says he’s confident that the nerve will heal and I will regain most of the feeling (fingers crossed). The cuts on the sides of my lips are finally healed so now I don’t have the added pain of my lips splitting back open every time someone decides to make me laugh! I have to say Christmas dinner was the worst. Tons of delicious food right in front of me and I’m stuck with Ensures and broth /: Then I had all my little cousins trying the poke at the braces and bands in my mouth asking what they were and why I could open my mouth. Anyway, I return to work on Monday and I have to say I’m looking forward to getting out of the house! Thank you for the recipe I’ll definitely be trying it soon! Ugh, I cannot imagine how you guys managed to drink ensure for so long; I could barely finish the ones they gave me in the hospital once they took me off the IVs. I had one of each flavor over the course of a day and while they all started out tasting pretty good (the two days of NOTHING probably had something to do with that), by about four syringe fulls I was finding them too sickeningly sweet. I had a battle buddy pick up a pack of Premier Protein shakes from a costco by him; I find them a lot easier to tolerate in terms of flavor. They probably don’t have near as much vitamins/minerals in them, but at 30 grams of protein and something I can at least finish (barring my pain doesn’t get too bad before I can–on day 4 I think and swallowing just gets everything aching thanks to the bands) they can’t be a terrible alternative. Gonna try some juice later, and maybe some soup, now that it’s getting easier to rinse my mouth out. Wish I had more than liquid Hydro for the pain, though–It barely takes the edge off. The morphine at the hospital (they had me there until day three) wasn’t doing anything put knocking me out, either… My surgeon really isn’t a fan of Ibuprofen or anything similar that increases bleeding risks *sigh* half tempted to try and get a pill down, anyways. well I had maxilofacial surgery due to a brawl in a bar. A one Lucky punch knocked my Jaw out of place. I am now on the 6th week since my surgery, but stil finding it hard to eat solid foods. And also I have lost 10 pounds since my surgery. Been bck in the gym now but straining my face as I’m lifting weights not helping with my recovery. But I think I should do lighther weights for now. I just wanted to know have you ever got your feelings back from your lower lip and chin as mine is still very numb and tingly. And when I go to bed and lay down it just feels like my lower jaw is just grid lock with with my bottom teeths. It just feels pretty much weird. It’s just too stiff. I wonder how long will it take to get that natural sensation again of just feeling like your mouth is just free again. But yeah eating solid foods feels pretty much like a struggle. Tried eating fries and it’s a battle, eat the fish burger from Mcdonals but it was a battle still lol But I really just want to bite the good old beef burger. Well I just hope I’m be able to eat on food like I once did before my surgery. Thanks for doing this! My daughter is having this surgery on June 17, and it’s helpful to read what you went through and your recommendations. Erin, I’m happy to help. All the best to your daughter next week! Stephanie, if you’re in pain and your medication is almost finished, I would try to go a day without it. Stay well-rested and keep a heat pack on your face as often as possible. Make sure you’re drinking at least 1–2L of water per day as well to aid your body in healing. If you’re finding the pain unbearable, your surgeon should prescribe you another small dosage of codeine. I’m sure if you attempt a drug-free day and cannot handle it, they will understand and write you a small prescription. Good luck! My recovery is going well. I get worn out fast, especially toward the evening. My biggest complaint now is that it seems that the stitches in the very back corner of my mouth on the left side next to my joint didn’t hold. When I slip my tongue back there I feel I big gaping hole. I called my surgeon and he didn’t seem worried. He said he has seen it where he could even see the plates exposed but the mouth has a way of healing over time. So I am just keeping up with the saltwater washes and hoping it’ll stay clean enough and that the hole will close up. Thanks for sharing your experience, it’s my little daily treat to get on here and read your posts as well as everybodys comments. I hope you are on somewhere on a mountain rock climbing right now 🙂 I am in Utah, there is some great climbing here. I’m so happy you find my ranting enjoyable! It honestly began as a way for me to maintain sanity during those initial days, but has since blossomed into quite a community. Who knew! When it comes to stitches, I have no professional opinion on the matter, but a general rule of thumb is that if there is no pain, there’s no problem. If the area is still not healing over in a month or so, you may want to go force your surgeon to stitch it up to avoid a prolonged recovery. I’m currently freezing up here in the Canadian prairies, but hope to be in another country at some point in the near future. Stay happy and I hope to hear from you again soon! I am currently on day 10 of my recovery and have a question for you.. I was wondering if you could move your jaw from side to side at this point? I woke up this morning and noticed that I had a bit of mobility in my jaw, I found it kind of concerning see as how I figured I wouldn’t be able to move my jaw while it was tight in the elastics. Just came across this blog….my 17 year old daughter is having upper, lower, chin and all wisdom teeth done in 11 days. I am more nervous than she is! She watched a video blog a teenage girl did for weeks after surgery so she has a better idea of what to expect. My big thing is going to be feeling helpless when she is in pain and also trying to figure out what to “feed” her other than Ensure. Any good recipes for protein shakes?